هذا المقال أيضا متوفر باللغة العربية. Al-Khalidi Street (for which the official name is Ibn Khaldun Street) underwent a transformation beginning in the late 1980s from a primarily residential street into a high-density medical one including clinics, laboratories, and pharmacies that is anchored by al-Khalidi Hospital, which is amongst Jordan’s best-known hospitals. The high influx of people to the street, along with its poor and outdated infrastructure, has led to traffic mismanagement, high levels of congestion, and chaotic conditions where pedestrians and cars are continuously competing for space. 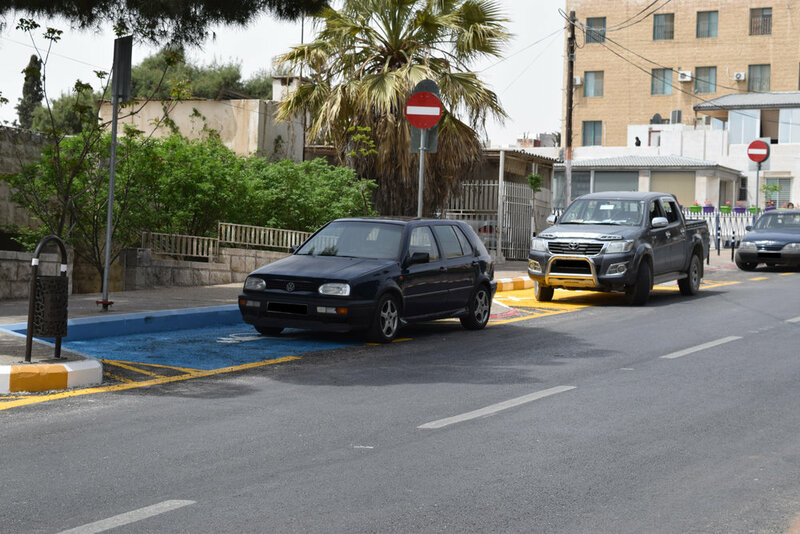 The Greater Amman Municipality (GAM) recognized that the mobility problems affecting the street have escalated to alarming levels, and accordingly implemented a project to alleviate some of these problems. This project is one of the few in Amman and in Jordan that aim at enhancing pedestrian infrastructure. 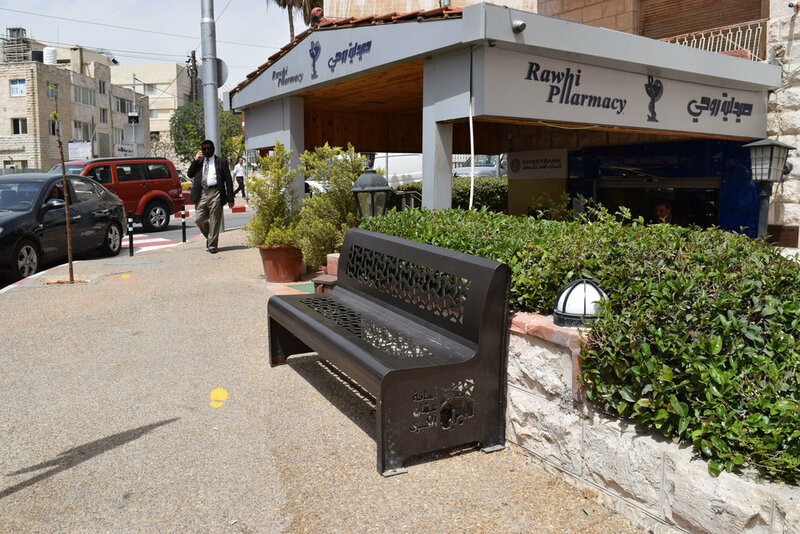 It is in fact the first project aimed at enhancing pedestrian access in Amman since the Wakalat and Rainbow streets projects that took place in the middle of the first decade of this century. An image showing a designated area for dumpsters. An image showing the new crosswalks and ramps. People using the newly-added benches. A sign showing the times when street-side parking is free and when it is for a fee. An off-set street-side parking area. Low poles have been installed to prevent cars from parking on the sidewalk; and the street has been provided with new waste bins. 1. A newly-expanded sidewalk with planters that double up as seats. 1. A warning sign indicating that cars parked in the no-parking zone will be towed. 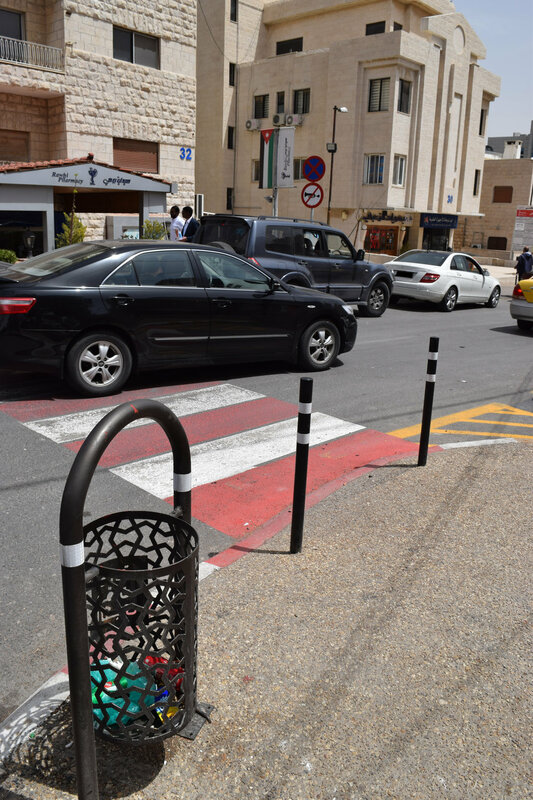 Unlike these two previous projects, however, the Khalidi Street rehabilitation project approaches issues of pedestrian and vehicular mobility, as well as parking in a more ambitious manner. 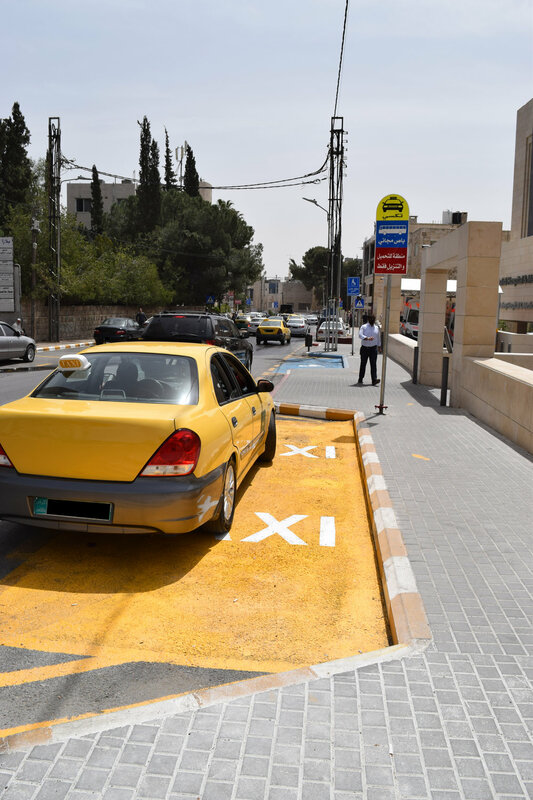 It features clearly-marked offset street-side parking spots, designated handicapped and taxi parking spots that are painted blue and yellow respectively, and low poles that have been placed to stop cars from parking on the sidewalks as is commonly the case in Amman. Additionally, GAM has partnered with e-payment service provider aya.jo to introduce an on-street paid parking mechanism during certain hours of the day. This mechanism enables drivers to pay for their parking spots using reloadable accounts through their smart-phones. They also will be able to buy parking credits at supermarkets or at any of the aya.jo booths located along the street. The new paid parking mechanism was to go into effect on May 1, 2017, but the month of May has passed, and this parking arrangement has yet to be implemented. Additionally, pedestrian infrastructure has received a considerable upgrade through the expansion of sidewalks, the use of clearly marked crosswalks, and the addition of ramps connecting streets and sidewalks that have improved conditions for the disabled and the elderly. These interventions have completely transformed the street, and the addition of benches, waste bins, and planters have made it more appealing as a public space. Cars parked in a no-parking area. A car parked on the sidewalk. Cars illegally parked in the handicapped and taxi parking zones. Two vans parked in a taxi parking zone. A car parked in a no-parking area with a part of it jutting out into the street. A taxi parked in a taxi parking zone, but a part of the car juts out into the street. A designated handicapped parking area. A broken pipe in the park spouting water onto the street. A water puddle forming in the street because of water leaking from a broken pipe. The CSBE team has documented and tested the changes made to the street through producing the following video. The changes are clearly a step in the right direction in terms of improving pedestrian infrastructure and organizing traffic management. We noticed, however, that many people unfortunately deliberately misuse this space wherever they can. Even with the presence of a clear signage system, the lack of enforcement means that people still try to "beat the system" as indicated by the spread of several parking breaches including parking in No Parking areas and even on some sidewalks. Parking spots reserved for handicapped and taxi parking are not being respected for the most part. The misuse of existing parking arrangements remains a major problem in this area. If this continues, and a strict enforcement of parking regulations along the street is not put in place, then many of the physical improvements made to the street will prove to be for the most part useless. 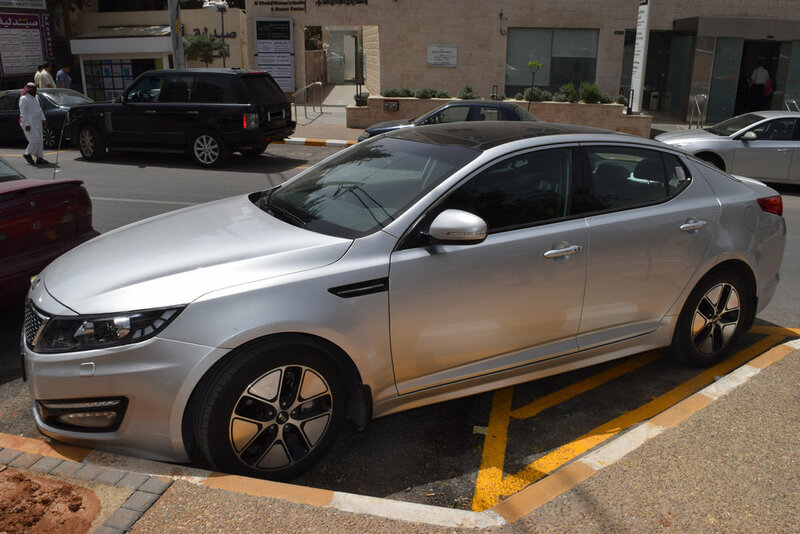 Although the newly-added pedestrian ramps provide a marked improvement in relation to preexisting conditions, there are ramps that very hard to navigate without assistance, especially when accessing the clinics or buildings that have entrances off al-Khalidi Street, and some are obstructed by parked cars. Moreover, most drivers do not stop for pedestrians at crosswalks, as they should, but the prevailing slow traffic speeds normally allow pedestrians to cross streets with relative ease and safety. 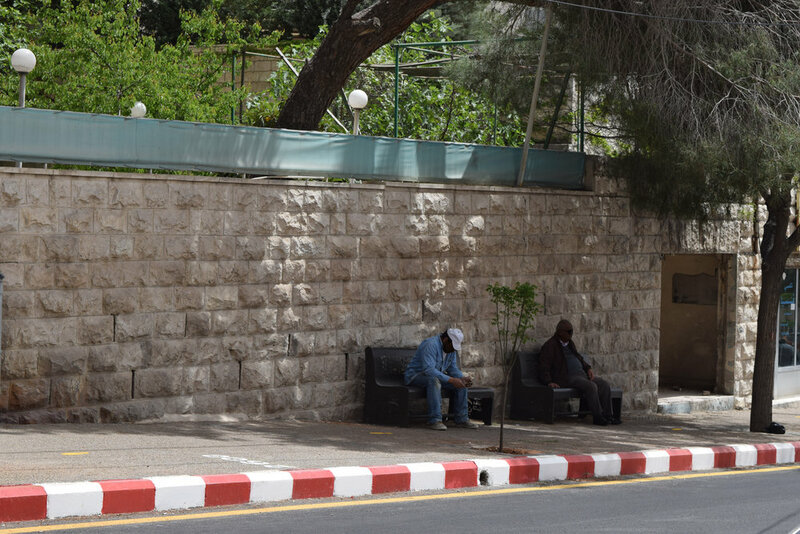 In spite of its shortcomings, the rehabilitated al-Khalidi Street remains one of Amman's most pedestrian-friendly streets. We in fact walked along Methqal al-Fayez Street, the next parallel street to al-Khalidi Street, to highlight some of the differences between a regular street in Amman and the improved al-Khalidi Street. The sidewalks along Methqal al-Fayez Street are characterized by sudden level changes and a ubiquity of broken sidewalk paving tiles. Moreover, it is almost impossible to walk a few meters without having to get off the sidewalk because of an obstruction along it such as a tree, an electricity pole, a garbage container, or a parked car – which provides a stark contrast to the conditions present in the improved al-Khalidi Street. The Khalidi Street rehabilitation project is a step in the right direction. It emphasizes the rights of pedestrians and attempts to organize the use of the street in a manner that takes the pedestrian into consideration. An upgrading of other Streets in Amman along the same lines would help create a better a pedestrian network in Amman, and hopefully make walking a more viable form of mobility in the city.